Finding you’re beginning to struggle with everyday tasks is extremely frustrating. People can quickly lose confidence and independence over relatively ‘small’ difficulties. Chances are, many people have suffered the same problems as you and there is likely a range of gadgets out there to support you. 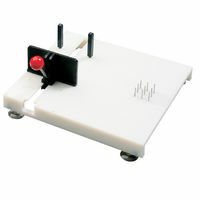 Many of our customers are surprised at the sheer volume of handy assistance items available for the smallest of tasks. Here’s a short list of some of our best selling items that you may not know exist. If bending and reaching your feet is proving difficult, Sox-on will be you new best friend. This handy contraption is a sturdy frame covered with terry towelling fabric which holds your sock or stocking securely whilst being pulled over your feet. Sox-on is machine washable, durable and easy to use. It’s not until turning knobs become a difficult task that we realise just how often we need to do it. From taps to doorknobs to washing machine and cooker knobs, they’re everywhere. The Uni turner is specifically designed to make these everyday tasks much easier. 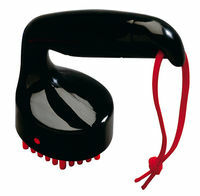 It has a comfortable handle and the user can utilise both hands where necessary. This multi-purpose non-slip material solves many stabilisation and gripping problems for those with limited dexterity. The material grips on both sides to prevent movement on dry slippery surfaces. Available in many sizes and washable in warm soapy water. 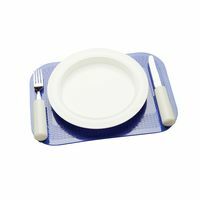 Use Dycem matting to open cans and jars, or to serve as a placemat or underneath your cutting board. A very handy addition to any kitchen. Do you find you’re having trouble lifting a full kettle? 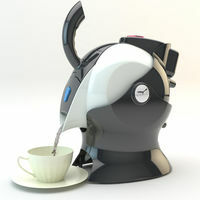 The task can once again become a ‘cup of tea’ with the help of this attractive kettle tipper. No pressure or lifting required, the Uccello kettle is ergonomically designed to deliver steaming hot water by gently tipping the kettle. 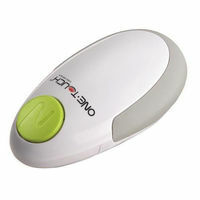 Also featuring auto shut off with overheating protection, quiet boiling and a non-slip base. Those who have difficultly gripping, or may only have the use of one arm love this clever food preparation system. No need to give up when it comes to cooking, this durable cutting board has four non-slip rubber feet to prevent the board moving and has suction pads available for use on wet surfaces. The clamp can fix such items as tins, bowls and of course vegetables. The steel spikes also keep your veggies still when peeling or cutting. Everyone should have one of these, so easy it must be seen to be believed. The innovative hands-free one-touch automatic can opener suits most cans between 53mm and 153mm in diameter. The opener ‘walks’ around the can and switches itself off automatically, leaving an easy-to-remove lid with no sharp edges. Perfect for seniors, or anyone really. One touch also make fabulous jar and bottle openers, you’ll love it so much we bet you get the whole set. Technology ensures there are always new and innovative products bursting onto the market to give us a helping hand. If you’re struggling with daily tasks, we should be able to source something to help you regain control. Get in touch with our team for some friendly advice.